Goodnight Gorgeous Sleep Masks . 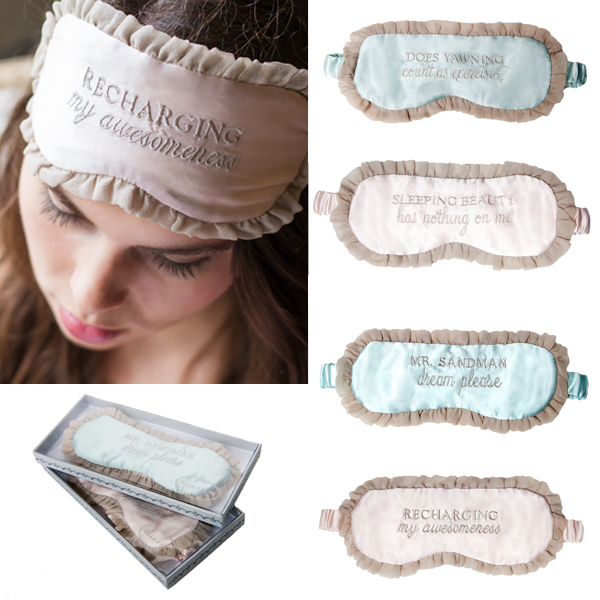 . .
from Bella il Fiore are Sleep Masks at their finest. Truly . . . made and filled with finest silks these lovelies look and feel luxurious and the sayings are completely sassy and adorable. "Recharging My Awesomeness" and "Sleeping Beauty Has Nothing On Me" are available in Bella's signature pink and "Mr. Sandman, Dream Please" and "Does Yawning Count As Exercise?" in a silvery, powder blue. Beautiful? yes! Luxurious? no doubt. Practical? ABSOLUTELY. Sleep Masks promote better sleep. Boo Boo Couture Ice Bags — poofs of goodness!